Call me old fashioned, but I believe that my word is my bond, something that you can trust. My blog is comprised of many, many words, all of which form a trusted bond with my audience and other bloggers. I worked hard to establish this trust and I take it seriously, as do most legitimate bloggers. We know that if we are dishonest with readers, we betray their trust and degrade the institution of blogging. Moreover, as lawyers, we have an added ethics obligations to portray ourselves honestly. Now that I’ve explained my perspective, perhaps you’ll understand why I’m so upset about the recent revelation by prominent copywriter blogger James Chartrand, the so-called front man at Men With Pens, that “he” is really a “she.” As Chartrand explains over at Copyblogger, she created a male persona because as a woman, she faced so much gender bias that she couldn’t earn enough to support her family. But as a male, Chartrand found the financial success that eluded her as a female. So what’s wrong with this picture? Well, nothing, except if you consider that Chartrand used her blog to preach the importance of transparency at posts like this or this. Yet, Chartrand apparently didn’t believe that the rules of transparency applied to her. Even worse, Chartrand didn’t simply omit information about her identity – for example, by hiding her gender behind an ambiguous name, ala JK Rowling or SE Hinton or a cloak of anonymity. Anonymity signals to readers that the blogger is trying to avoid disclosure but in many sensitive situations (for example, like that of Gideon, the public defender blogger or when David Lat blogged at Underneath Their Robes), it may be the only option, and readers can respect that choice. But Chartrand did more than simply leave out information about her personal life or use a fake name. Instead, she intentionally created a completely false persona. Chartrand called herself a front man for her all male company, and described herself several times as a dad. She dissed mommy bloggers for being intolerant when she (then posing as he) “risked [her] balls” to comment in their online fora. She concocted a bogus excuse for not putting a photo of herself on the site. Even taking at face value Chartrand’s contention that her kids would have starved if she didn’t pose as a male (and it’s hard for me to take anything that this blogger says at face value anymore), there were many other less offensive ways that Chartrand could have kept her gender hidden without creating an entirely fake facade. To Chartrand’s credit, she’s built up enough of a fan base that her flock has either applauded or forgiven her. As for me, I’d have reservations about hiring a service provider who’s not been honest on her blog. I’m a lawyer and even an inadvertent ethics related misjudgment could put my license on the line. 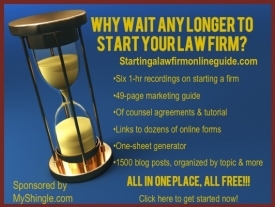 There are already too many seemingly legitimate lawyer marketing scams and schemes to get lawyers into trouble. So why take a chance on working with someone who’s demonstrated a willingness to cut corners on the truth just to make a buck? [edit – I might change my views on Chartrand down the line because I don’t believe that one error of judgment should doom one’s career permanently. But rebuilding my trust will take time, especially when Chartrand does not even express any remorse about misleading readers]. Let’s just be clear about one thing, though. The reason that I wouldn’t hire James Chartrand has nothing to do with gender, and everything to do with lack of transparency. As Kevin O’Keefe says here, lawyers need to know whether a prospective blog or social media consultant whether they walk the walk. In this situation, if the only way that a copywriter can figure out how to sell services is by being dishonest, well, then, that’s probably not the kind of person I want to work with. As a female lawyer, I don’t have the luxury of pretending to be a guy to generate business – unless I want to lose my license. Some might argue that one’s gender or identity isn’t material to the substance of the blog or the product that one can produce. I disagree, for several reasons. First, when it comes to truth-in-blogging, a bright line test is critical because otherwise the line will keep moving. If we say that it’s alright to create a false persona around something like looks or gender, does that mean that it’s alright to lie about our credentials? Can we claim that we handled cases that we didn’t? Create war stories about glory days in court that never happened? At what point do lies completely destroy a blog’s credibility? . If this were just a story about a single blogger or a service provider, I could let it pass. But it speaks to a bigger lesson: the obligation that we bloggers owe our readers. Blogging gives us a powerful tool – the ability to create an authentic image online and to build trusted relationships with readers that they don’t have with other forms of media. When we betray that trust, we ruin our relationship with readers and open ourselves up to increased regulation (as the FTC is already doing with recently announced policy on blogger endorsements). At the end of the day, blogging is a matter of trust. Those bloggers who aren’t willing to honor the trust with our readers, shouldn’t be calling themselves bloggers. Marketers, advertisers or hucksters, perhaps. But not bloggers.